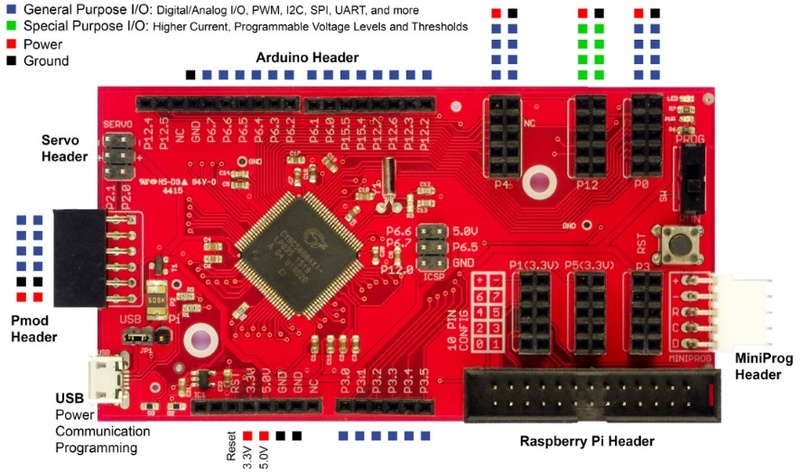 The PisoC is an easy to use electronics development kit that grows with you. With the PiSoC you can control LED’s, servos, touch sensors (use fruit as an input! ), ultrasonic rangers, and more just as easily as you would do anything else in Scratch or Python. You will need a micro USB cable that do can data transfer (most phone charger cables will work) to use your PiSoC. You can find software installation instructions here. If you’re just starting out you can use our Scratch extension. NEW: Check out our new Circuit Playground Inventor’s Kit, with Scratch support right in your web browser! More experienced users can move up to Python. You can also go lower level with PSoC Creator. You can plug your PiSoC in into your computer via a simple micro USB cable. We support Scratch and Python on Windows, OSX, Linux, and Raspberry Pi. PSoC Creator is currently Windows only. We will continue posting tutorials for Scratch, Python, and PSoC Creator, so keep our learning page bookmarked.